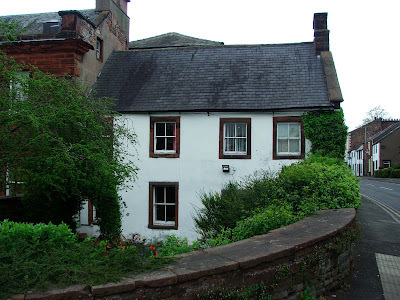 At the junctions of Friargate, Folly Lane and Benson Row in Penrith sits Hutton Hall. The building consists of three seperate but conjoined structures. The main and largest part of the building is the red Penrith trade mark sandstone 18th century building. This part of the building used to be Penrith's Masonic Hall. The second part of the building is the small cottage joined to the right of the main building. The cottage is 17th century and the oldest part of the whole building is joined to the back of this cottage. Walking down the side of the cottage into Benson Row, the pele tower rises above the walled enclosure that now surrounds the site. Above. Looking North West towards the cottage that hides the tower. The tower is almost square, four storeys high, and built of red sandstone....although this is hidden by badly deteriorated render. The tower may have been built in 1397, when William Strickland obtained a license to crenellate his dwelling, however this license may actually relate to Strickland's pele tower, the original part of Penrith Castle. Whatever the relationship with this licence, the tower was almost certainly built in the late 1300's and is in remarkably good condition. Above. The tower is visible from the road, with the wall low enough to provide good views. The existence of a fortified tower, rather than a fortified town house in the middle of a busy market town, is somewhat of a rarity. 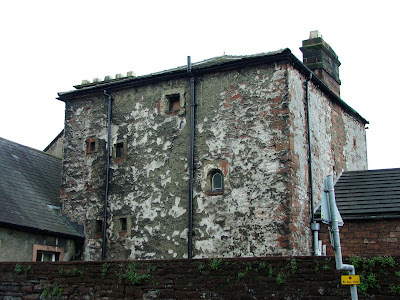 Peter Ryder indicates that the small windows, devoid of any decoration, have more in common with Border bastle houses rather than pele towers or tower houses, and it is this mixture of architectural detail that provide so much interest in this small tower. The wall that survives on the North and East sides of the tower may be contemporary with the tower...perhaps all that remains of a curtain wall or barmkyn. I hear they want to demolish it! What's the point of Listed status in that case? Grade 2 Listed Building always used to be no alterations to the outside of the building. The inside of the building could be brought up to modern standards but all original features retained. After building renovations in that vicinity, it has become an "eyesore"!! So much for Grade 2 listed building - the "local master builder" has painted the whole exterior of the tower making it look out of place and no longer a heritage site. Whay a pity !! I have written to local newspaper voicing my concern.